Adult beetles are 2-4mm in length, round in shape, the colour varies but usually the body is yellow, black and white. They usually breed once a year but in warmer climates or mild temeratures this can be twice. The female can lay up to 100 eggs which hatch after 2-4 weeks. The larvae are slightly bigger at 4-6mm in length. Nicknamed Wooly Bears because of the hairs protruding from their bodies. The larvae will cause damage by chewing on fibres in carpets and rugs, especially wool based items. 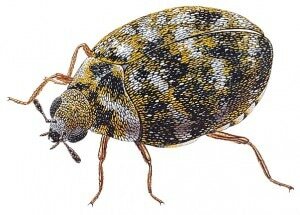 Carpet Beetle Pest Control Measure: Insecticides can be used to treat infested premises and protect them from re infestation by spraying carpeted areas. Please call for advice / quote or to arrange an inspection.